The product was distributed nationwide beginning May 6, 2014 and can be identified by its Lot Code found on the side of the plastic pouch. in a single lot of the product. This batch tested negative by a third party independent laboratory prior to release for distribution to consumers. No additional products are affected by this recall. The company has received no reports of illness in either people or animals associated with these products to date. Salmonella can result in more serious ailments including arterial infections, endocarditis, arthritis, muscle pain, eye irritation and urinary tract symptoms. Some pets will have only decreased appetite, fever and abdominal pain. Infected but otherwise healthy pets can be carriers and infect other animals or humans. If your pet has consumed the recalled product and has these symptoms, be sure to contact your veterinarian. 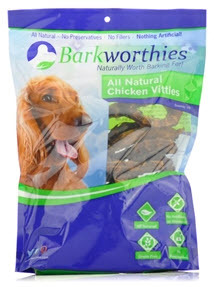 For a full refund, pet owners should return all unused product to their place of purchase along with a completed Product Recall Claim Form available on the Barkworthies website. Additional information regarding the recall can also be found on the company’s website — or call toll free 877-993-4257 Monday thru Friday 9:00 am to 5:00 pm ET.